As someone who tries to avoid it as much as possible, I know how stressful feeding your little one on the go can be. Not only are their endless things you have to pack, but it can be an all round stressful occasion. Hungry toddlers & public places do not mix, let me tell you that from experience. As travelling and trying to feed can be quite daunting, I was looking for a way to make it that bit easier & stumbled upon Oxo Tot, and I'll tell you why you have to have one of these fabulous travel spoons from Oxo Tot. Firstly, being a slight organisation freak, it comes with it's own carry case (how cute) it's proportionately bigger than the spoon so taking up barely any extra room, yet saving you so much time - no need to re-wash the spoon when you grab it from your bag, so avoiding tantrums when you're little wants their food ASAP and it also means no more dirty changing back when you put it away, perfect right? I also discovered something in this spoon I'd never come across in any others, whilst Noah put it through it's paces when demolishing a yogurt, he wasn't thrusting the yogurt at me to get the last bits for him, because the soft silicone tip design of this spoon allowed him to really scrape up every last bit = happy toddler and happy parents. I also discovered the fantastic travel bib from Oxo Tot, and it's safe to say I'm purchasing more for meals at home, I only wish I'd discovered it sooner. The bib has an adjustable Velcro strap at the back, so you can make it as snug or slack as you like, we like it snug to avoid any dribbles or drops of food on Noah's t-shirts. It also roles up super neatly into itself so I can pop it in my bag along with his travelling spoon. Oxo Tot have really made my life a lot easier, they've really thought of convenience for both mother and baby and I can't wait to delve further into their range. What is that he's eating I hear you ask? 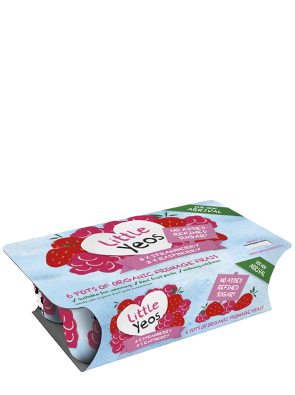 It's the yummy Fromage Frais by Yeo Valley, I like to feed Noah with the most healthiest snacks I can when we're on the go, and that's just why these are perfect, they include absolutely zero refined added sugar, and are suitable for all ages after weaning. They are incredibly creamy and Noah cannot get enough at the minute, as soon as he see's me open the fridge he's desperate to get hold of it, already saying 'Oghurt please mama' before I've pulled the top off. A perfect little snack to keep the hunger rumbles at bay. Have you tried anything from Oxo Tot or Yeo Valley? Does My Baby Have Asthma?